Live streaming startup Ustream has come a long way over the last several years, but one thing holding it back is its homepage, which is a hodgepodge of “featured” and recommended live stream feeds, some of which are active, some of which click through to archived, on-demand videos. It’s not entirely clear what’s going on, what’s new, what’s popular or what’s trending. It’s looking to change all that with a redesign that goes live Wednesday, just in time for the first of the presidential debates. I got a preview of the site, as members of the Ustream team came all the way downstairs from their offices on the fourth floor of 410 Townsend to TechCrunch’s first floor suite. The new homepage is designed to highlight live videos across a number of different content categories, allowing users to click a thumbnail and have the video instantly appear. That means instant access to live video without having to click through to another page for viewing. The launch is meant to coincide with the first of the Presidential Debates, during which Ustream will have at least two live feeds from AP and CBS News. But it will also have a ton of other debate-related video feeds available, including commentary from a number of other Ustream partners, like the Debate Drinking Broadcast or RuPaul from Logo TV. It’ll also have featured videos across its major verticals like news, and will even feature eagle, donkey, and elephant cams. 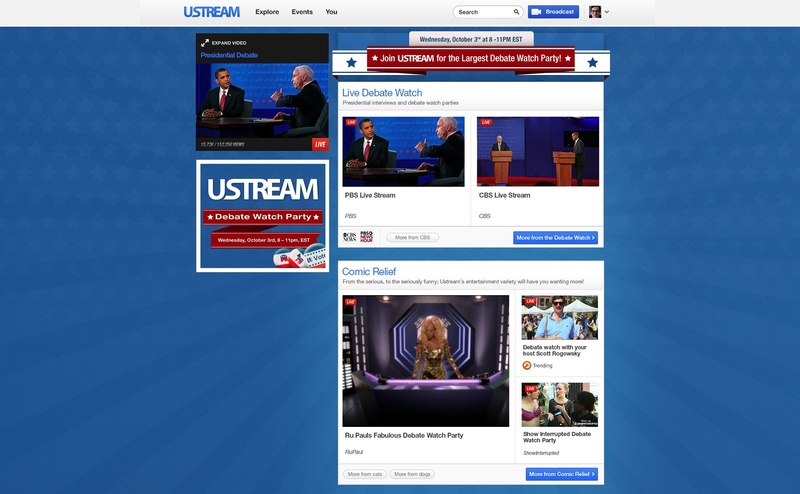 The design that users will see on Wednesday is skinned and built all around the debates, which is something that Ustream will be doing more of, as it plans to highlight major live events and breaking news. It might not have a reskinned homepage every day, but it could program the site two or three times a week, depending on what’s happening, according to SVP of marketing David Thompson. Partners are a big part of this release, as Ustream herds together a number of live video producers. In addition to RuPaul, Ustream’s got content from PBS NewsHour, Occupy Denver, Occupy the Debates, Breitbart News with Larry O’Connor, League of Young Voters, PopSugar, comedian Scott Rogowsky, Crack.com, Show Interrupted, and comedians Al Del Bene and Rich Aronovitch. And powering the whole new Ustream homepage is a 12-person editorial team that will curate videos based upon topics and what’s popular or trending on the site, bringing more visibility to content that previously might have been difficult to find. One surprising thing that will be missing at launch is ads. Throughout the demo, I was amazed(!) to find that not a single ad showed during the whole visit. No crappy banners sitting alongside the video thumbnails. No crappy pre-rolls when videos were launched. No mid-rolls jumping into the middle of my streams, slowing my roll. Really dudes? How’re you gonna make the monies? Thompson says the redesign is rolling out ad-free as part of Ustream’s attempt to bring the best viewing experience possible, which is awesome for now. The lack of ads on the new homepage follows the rollout of Ustream’s Broadcast for Friends (BFF) app, which hooks into Facebook and also streams video ad-free. Ads will eventually return, but Thompson said Ustream is devoted to balancing the optimum viewing experience for users while also monetizing via ads. What does that mean? Fewer ads? I think it sounds like fewer ads. Ustream has famously raised a buttload of money, but seemed to be struggling for a while, trying to find itself with founder John Ham at the helm. He’s since stepped down and the company, now being run by CEO Brad Hunstable, seems to be more focused on product and introducing new applications for users, which is cool and aligns more with my interests, rather than just pitching me every time a celebrity does a 30-second live stream.